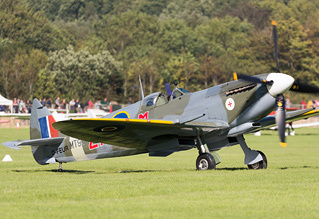 On Tuesday 15th September, Goodwood Motor Circuit and Airfield opened its doors to over 30,000 members of the public to witness the spectacle of a mass launch of a gathering of over 30 Spitfires, Hurricanes and Blenheim. Taking part in a number of flypasts to commemorate Battle of Britain Day and the 75th anniversary of the conflict, the skies of south east England resonated to the drone of Merlin, Griffon and Mercury engines once more. Andy Evans felt privileged to attend this event and reports for UKAR, photography by the UKAR Staff team. 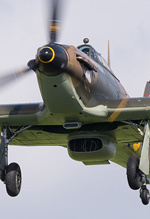 If the 2015 season is remembered for one positive thing then it must be the effort expended by airshow organisers in ensuring the 75th anniversary of the Battle of Britain did not pass unnoticed. Whilst the summer of 1940 is known for some key events such as Eagle Day; there is no more fitting day to remember the sacrifices made by the United Kingdom, her commonwealth and her allies during those short months than September 15th - Battle of Britain Day. 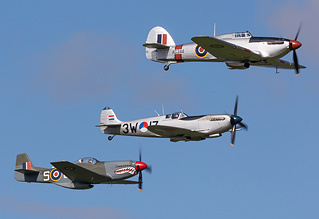 There have been numerous instances over the summer of mass flypasts to commemorate the Battle of Britain; the most notable up to this point being that seen at the Royal International Air Tattoo. We may have stated that their attempt could have been better but we wouldn't deny that what they did achieve was still commendable, successfully launching 18 warbirds into the sky at once at such a major event. Other events of note have included photocalls where the aircraft have been available on the ground to picture up close - however, the ticket price being charged by some did somewhat detract from what was being commemorated. It therefore fell to the Boultbee Flight Academy to deliver on their previously announced plan to fill the skies of Southern England with up to 50 Spitfires and Hurricanes (together with one often overlooked Blenheim). Despite the remnants of a meteorological hurricane trying its best to dampen and blow away the Academy's best laid plans, it is fair to say they certainly pulled it off in style. Owing to the weather, serviceability issues and a few unfortunate incidents in the run up to the 15th, the number wasn't quite the 40 that had been hoped for, however the organisers were successful in launching over 30 aircraft (including two Battle of Britain veterans) split into nine separate formation flights. What resulted was the largest gathering in probably over 50 years of airworthy Spitfires and Hurricanes; including aircraft from the USA and Europe that are rarely seen in the UK away from Duxford. Leading the formation was to be Battle of Britain veteran Wg Cdr (retd.) Tom Neil, HRH Prince Harry and two injured servicemen from the Prince's Spitfire Scholarship. 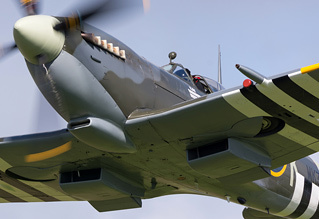 Unfortunately, one Spitfire refused to start on the morning and so in a true gesture of humility Prince Harry (who was also celebrating his 31st birthday) gave up his place to allow both of the servicemen to fly. Later, some of the formations were joined by the P-51 Mustang commonly known as "Shark Mouth" to provide some air-to-air photography. 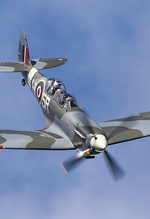 The action wasn't limited to take-offs, as had been feared at one point - with a number of aircraft returning to the airfield post-flypast, including a short Spitfire display in some of the best light seen in 2015. Of course, the prospect of such a gathering wasn't lost on the enthusiast and in turn, this wasn't lost on Goodwood. Taking advantage of the Revival infrastructure remaining in situ, Goodwood took the decision to open its doors to the ticket-holding public. Unusually for an aviation event, the tickets were free which was extremely welcome. It is without doubt that this aspect aided the excellent atmosphere on the day. The response from the public and enthusiasts to a free weekday event was huge and clearly more than the organisers had envisaged. In total over 30,000 people were in attendance and it was clear that the Revival infrastructure was under strain. Access was restricted to the racetrack perimeter which resulted in a little crowding - it also meant no up close access to the aircraft was available which disappointed some. In addition, the catering which was still in Revival "mode" and only located in a few heavily-used spots has been criticised since the event on social media - however, it must be remembered the site was set up for a racetrack-centric event first and foremost, not an airshow venue. Vehicular access to the event was difficult for some - exacerbated by a combination of rush-hour traffic, accidents on major routes, and an advertised start time for what was a relatively short event meant that the local area suffered quite badly. Whilst much of this was outside of the organiser's control; the impact of rush-hour traffic may be something that needs to be recognised by weekday events in the future. That said, on site communication was excellent and the organisers were quick to announce information - crucially, which runway would be in use. 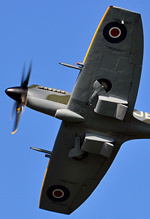 This allowed for everyone to position themselves in an ideal spot to view the days flying with plenty of time to spare. Some may consider photocalls with closer access to be better events - however tickets for those events often cost more than most airshows, in the region of £40+. When combining the sheer variety of Spitfires, Hurricanes and other types that took part, the cost of the ticket, the unique angles available, the weather and the superb atmosphere; it is fair to say that Goodwood is currently in pole position for the best 75th anniversary commemoration event we have witnessed this year. Whilst in its essence this event was not an airshow, the sheer volume of visitors is a clear indication that the public's thirst for aviation events remains undimmed, even during the working week. Perhaps its success might entice Goodwood/Boultbee to host similar events in future? We certainly hope so.